It is hard to not be curious about this restaurant, especially since it has a large billboard as you enter the carpark of the Podium Mall in the Ortigas Center of the Philippines. 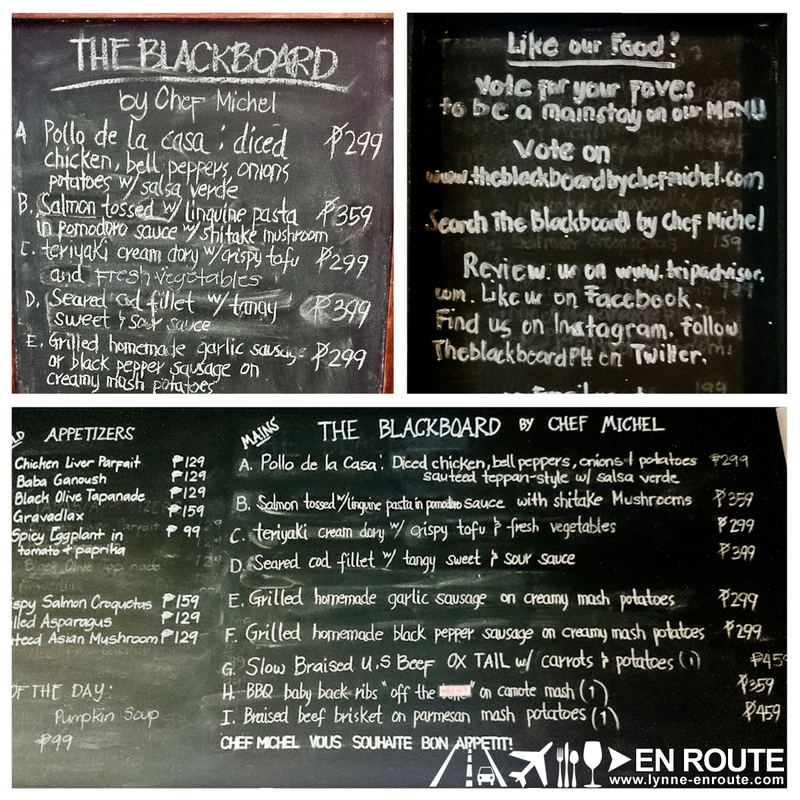 The Blackboard by Chef Michel looks promising, with its scrumptious looking pictures of the dishes. It does seem to be a good place for a sit-down dinner. Apparently the concept of The Blackboard by Chef Michel is they will create dishes depending on what is in season and what is available fresh in the market. This idea is something that has become revolutionary in the Parisian bistro food scene as of late, where chefs have begun deviating from the tyranny of set recipes, and apply the spontaneity of working with all that is available in the market. It can be quite risky, as customers may feel like guinea pigs for new twists into food cooking. But, life won’t be that exciting if there wasn’t a little bit of adventure, wouldn’t it? One thing that was fantastic about this approach is that The Blackboard is able to keep costs low as they require minimal shelf storage and just get what is available. The advantage of this also is that the food is fresh all the time. The disadvantage? There will only be a limited amount of a certain item. In the case of the baby back ribs, there was only one left that night, and so it was ordered to finish it off. Smoked Salmon Gravadlax (PHP 159.00). First time to try this was back in a whisky tasting session (It was named Gravlax then, but apparently both names are acceptable). Not bad price for this appetizer! Maybe reduce the dill a bit to make the fatty flavor of the salmon stand out, and this will gain a large following. One thing that had everyone clamoring for more, though was the Pumpkin Soup (PHP 99.00). Aside from the price, the thickness and temperature was very comforting. The croutons had too much garlic in them, but that can be set aside. 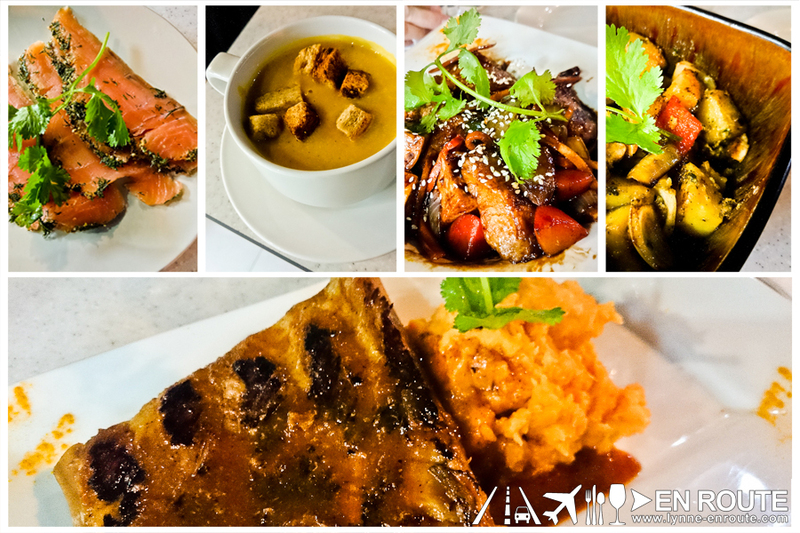 The two Asian inspired dishes were the Teriyaki Cream Dori with Tofu (PHP 299.00) and the Pollo dela Casa (PHP 299.00). It is a diced chicken dish with onions, pepper, potatoes, and sauteed teppan-style. The teriyaki sauce has a good balance of sweet and soy-saltiness, but the Pollo dela Casa could have done with a bit more. Someone from the table mentioned it tasted “healthy” (which was his polite way of saying it tasted bland). Maybe just a bit more seasoning? Overall, the price point and the idea that a dynamic menu will keep people coming back. What people should expect is that since recipes will always be changing, some of what they may have liked before will not be available. Oh, and the mood of a chef can change things greatly, too. A little spontaneity never hurt anyone, though.